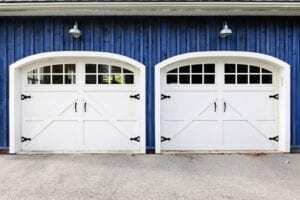 Home » Blog » Is a Carriage House Garage Door Worth The Price? As a homeowner, making your home as attractive as possible on the outside can be a major priority. If you have a garage, you may consider getting a carriage house garage door to add that special touch and customize your home. A carriage house garage door or carriage house garage door is fashioned after carriage house doors that used to house horses and carriages. It was called a carriage house because it was smaller than a barn and was on estates of the wealthy. It had wide, swinging or sliding doors. Why would I want a carriage garage door? Carriage doors are coming back in style, adding variety and a unique curb appeal to the outside aesthetic of the home. They add a distinguished look and are great conversation pieces, and can increase the value of your home. Carriage doors can be installed with the assistance of a professional, providing creativity and diversity to your space in the neighborhood. How much do carriage house garage doors cost? Some options on the market may meet your needs. A typical carriage door can cost $3,000, but there are also affordable alternatives that may run between $900 to $1000. The cost of the carriage door is contingent on the style, size, materials, type of wood and other elements that will bring out your unique style and taste. How durable are carriage garage doors? Because carriage doors are typically constructed with top-of-the-line wood, they are equipped to withstand the elements. They also help in sealing the garage if you are interested in insulating the space because they close tightly against the doorstop. Will home value increase with a carriage door? When homeowners update their garage doors, it typically increases the value of the home because it adds an attractive element to the exterior. It can be one of the most valuable upgrades that will provide a high return on your investment. Adding a carriage door can give your home elegance and style. One of the keys to keeping your carriage door in top shape once installed is to have it periodically serviced and repaired. Considering it as a part of your home that requires regular maintenance at least once a year will ensure you get the most from your investment. For more information on carriage doors and whether or not one would be a good fit for your residence, contact a team member today!